The official unveiling of the new LIGHT Bus was celebrated October 24, 2018. Home / Resurrect the LIGHT VW Bus / The official unveiling of the new LIGHT Bus was celebrated October 24, 2018. 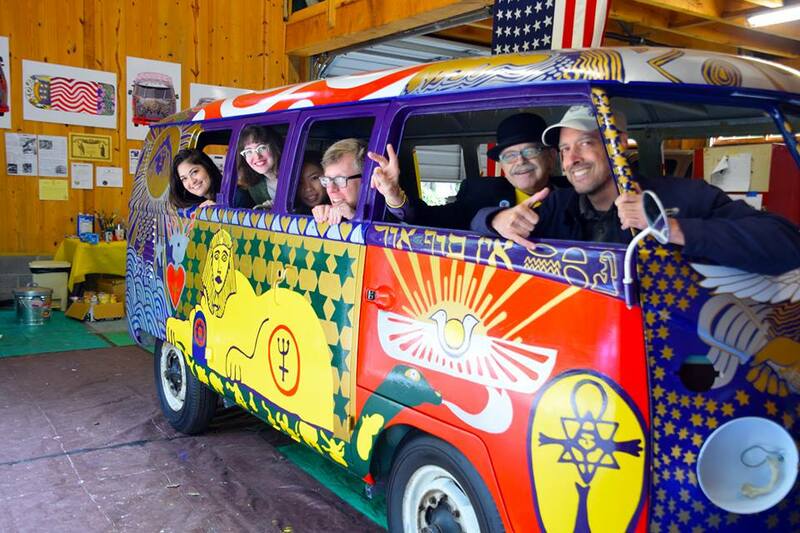 Our Team of LIGHT Workers include: Dr. Robert Hieronimus (original artist and designer), Bob Grimm (original owner and commissioner), Trudytective Cooper (sitting on top of the bus in the famous AP photo from Woodstock), Linda Zacharski (Woodstock alum), John Wesley Chisholm (Project and Film Director) and Fallon Taylor (mechanic of the interior and finishing) and Robert Skinner and Marlo Ann Walsh-Skinner (mechanics for the engines and body) and Rodger Roundy (artist) and Jess Rassp (artist) and Lindsey Zuskin (artist) and Justin Williams (artist) and Lily Bleser (artist) and Dr. Queen Zohara, (without whom none of this would be possible).